C.A. Confidential: The Sean Stanley and Sokhna-Dior Trio Live @ Harlem Underground, Toronto, ON - Fri July 13th! The Sean Stanley and Sokhna-Dior Trio Live @ Harlem Underground, Toronto, ON - Fri July 13th! 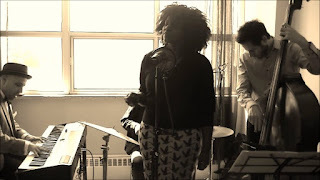 Swingin' , stomping, and singin, on Spirtuals, Ragtime, Blues & Jazz standards, The Sean Stanley Trio & Sokhna-Dior are an improvisational group of talented musicians dedicated to respecting the true spirit of Jazz. Founded by Sean Stanley on piano and vocals, and Sokhna-Dior on vocals and percussion, the group regularly features some of the city's most talented musicians on upright bass, drums, trombone, trumpet and more.